In the previous book in this series, The Kane Chronicles, Sadie and Carter Kane learned that their heritage to the Egyptians ability allowed them to use magic to their desires, and such people were part of a secret society. Such individuals are referred to as magicians, who must all face the daunting task of preventing the awakening of Apophis, the Chaos snake who sought to swallow the sun to show his resentment to Ra, the Egyptian god who had imprisoned him long ago. In the story, The Throne of Fire, the magicians are becoming more desperate to stop their enemy, but the Kanes have a plan against their commands, to vanquish it by awakening Ra, the sun god, to defeat Apophis like he had done long ago. Unfortunately for the Kanes, Ra was entombed in an unknown place, likely far away from the their grasp. To make an effort to stop the threat of Apophis, the magicians collect three scrolls from the book of ra, located in a Brooklyn museum, a rebel magician’s house, and a very powerful roman’s tomb, to locate his tomb. They discover that it is located at the edge of the River of night. When they reach their destination, they discover that Ra has become old and senile, unable to fight Apophis again. Upon returning to Amos to tell him their news, he says that he has an idea to restore the god to his former glory, to be revealed at the end of the story. In my opinion, I would suggest this book to someone who enjoys fantasy stories with a great amount of detail, and reads every book in a series in order. While I was reading the book, its setting was not very clear because it is the second book in the Kane Chronicles series. This led to more confusing moments in the plot, giving me a more vague idea of what happens in it. 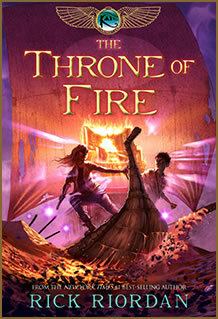 Some weaknesses of this story include being heavily connecting to the previous book in this series in terms of its plot, not much use of diverse vocabulary, and I felt as the author was not very creative in making a new series because this was inspired by Rick Riordan’s other series, which included greek and roman mythology as opposed to egyptian mythology. Strengths of the book include overwhelming detail, and being uniquely told in the perspectives of both Sadie and Carter.Out of all the age groups I think this book is suited for ten to twelve-year old kids and deserves seven out of ten stars. 1. Who is the new Chief Lector? 2. Whose perspective is the story told in? 3. Whose duty was it to protect Carter and Sadie while they did not learn magic yet to defend themselves with? 4. To defeat Apophis, what do Sadie and Carter plan to do? 5. After receiving summer enlistments, the Kanes train some of the people that joined, not accompanying them on their mission as it was too dangerous. Who do they train? 6. What is Walt’s curse caused by? 7 Who tells Sadie and Carter where part of the book of Ra is? 8. Where was Zia hidden? 9. Who dislike the fact that the Kanes are trying to awaken a god? 10. Who learned Ra’s secret name? 11. How do Sadie and Carter get time to awaken Ra after their deadline to awaken the sun god? 12. Who does Walt secretly make pacts with while Sadie and Carter are away? 13. At the end of the story, Who sacrifices himself to delay Apophis’s revival? 14. When Carter discovers that there is a planned attack on their society, what does he attempt to do to stop the attack? 15. When Ra was missing, the gods tried to elect a new ruler. Who was the first to be nominated?